Đerdap National Park, originally uploaded by bill kralovec. The past two days here in the Belgrade the famous Košava winds have been blowing through the city. The winds are caused by a air pressure gradient between the Adriatic Sea (low air pressure) and southern Russia (high air pressure). Air moves from high pressure to the low pressure. In between Russia and the Adriatic are the beautiful Carpathian Mountains. 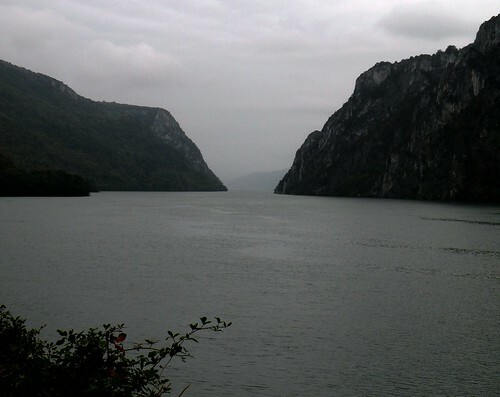 Above is a photo of the southern Carpathians that form a steep gorge on the Danube River. It is the famous Đerdap National Park, or Iron Gates. It is about an hour’s drive from Belgrade. As the air moves from Russia westward towards the Adriatic, it is funneled through this gorge. On the other side of this gorge is Belgrade. I can sure feel when the Košava is blowing! It is good that they clean out the city of pollution. They are bad in that they significantly lower the temperature in the non-summer months, especially winter. When I took this photo in 2009, I was only admiring the beauty of the park. Now I realize that it causes a focus and acceleration of the cold northerly wind known as the Košava. The locals claim it either blows for 1,3,5 days and they all believe it. It sounds like superstition as it doesn’t make sense for the cause of the winds, massive air pressure systems, to move out of the area in increments of an odd number of days. If a meteorologist can give me some background on this, I would appreciate it. So far this time, it is the third day as I write this. The Košava is strongest in the morning, so I’ll see if this is the last day it blows. P.S. Your blog is excelent! Keep up the good work!